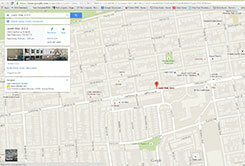 Whether you are visiting for the first time or are in need of something a bit more extensive, we are here to help. From digital x-rays to extractions, our general services for prosthodontics in San Francisco, CA are safe solutions to enhancing your dental health. For certain procedures, we may only need to numb a section of your mouth. In that case, we may suggest local anesthetic. Local anesthetic is effective when injecting medicine (usually Lidocaine) into your gum tissue or inner cheek to ensure the treatment area is numb. Although you are able to leave our office the same way you arrived, please allow for the anesthetic to have lasting effects for a few hours. Preventative dentistry is your answer to avoiding dental procedures in the future! At-home care—such as regularly flossing and brushing your teeth—will help combat the buildup of bacteria and plaque. In addition, your scheduled cleanings, screenings and other examinations will give us a better understanding of what is happening beneath the surface. Visiting our office at least every six months can help prevent tooth decay and gum disease, and will help your smile remain healthy. Impacted teeth, wisdom teeth or other troubled teeth that may need to be removed require proper treatment. Extracting these teeth is a task that is necessary when decreasing the chance of infection or other oral problems, and we are able to provide a safe solution in removing them. A root canal is a treatment performed when the nerve of a tooth becomes infected or damaged. 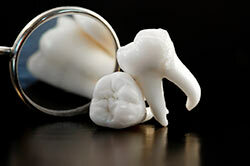 This procedure is dedicated to repairing and saving a tooth that is badly decayed. The tooth’s pulp and nerve are removed, and the space is cleaned and sealed. 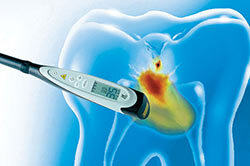 The DIAGNOdent pen is a hand-held laser that detects the precise location of tooth decay. If a portion of the tooth is decaying, florescence detection will appear on the DIAGNOdent device, allowing for us to more clearly see where the troubled area is located. Intraoral cameras are small, lightweight and non-intrusive devices that allow for us to use video technology to enhance efficiency and diagnosis. 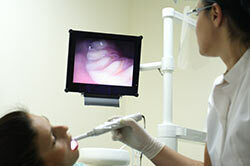 They enable us to quickly and effectively see aspects of your oral health that may be more difficult otherwise. If you are experiencing discomfort and are unsure of what the problem at hand might be, we can take a digital x-ray of your mouth and determine what is happening underneath the surface within seconds. Digital x-rays also allow for less exposure to radiation, assistance in early diagnosis and help us better understand your treatment options.